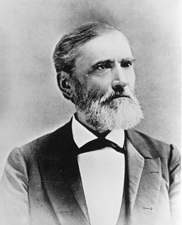 TURPIE, David, a Senator from Indiana; born in Hamilton County, Ohio, July 8, 1828; graduated from Kenyon College, Gambier, Ohio, in 1848; studied law; admitted to the bar in 1849 and commenced practice in Logansport, Cass County, Ind. ; member, State house of representatives 1852, 1858; judge of the court of common pleas 1854-1856; judge of the circuit court 1856; elected as a Democrat to the United States Senate to fill the vacancy caused by the expulsion of Jesse D. Bright and served from January 14 to March 3, 1863; moved to Indianapolis, Ind., in 1872 and continued the practice of law; member, State house of representatives, serving as speaker 1874-1875; one of the three commissioners to revise the laws of Indiana in 1878 and 1881; United States district attorney for Indiana 1886-1887; again elected as a Democrat to the United States Senate in 1887; reelected in 1893 and served from March 4, 1887, to March 3, 1899; unsuccessful candidate for reelection; Democratic Conference chairman 1898-1899; chairman, Committee on Census (Fifty-third Congress); retired from public life; died in Indianapolis, Ind., April 21, 1909; interment in Crown Hill Cemetery. Turpie, David. Sketches of My Own Times. 1903. Reprint. New York: AMS Press, 1975.